Fitted with the latest GC2 Launch monitor HMT and Foresight Simulation package, it really is the place to hone your skills, no matter the outside conditions. Once in the sudio there is a choice of heading to the driving range to practice, using the GC2 launch monitor to track every shot you hit, giving you vital statistics including, spin rates, launch angle as well as carry and total distance. Once these are looked at and discussed with our professionals, you can start to understand where your bad shots come from. Perhaps more importantly, these stats can be used to judge and assess improvements you have made in your technique, giving you excellent feedback otherwise impossible to view with the naked eye. 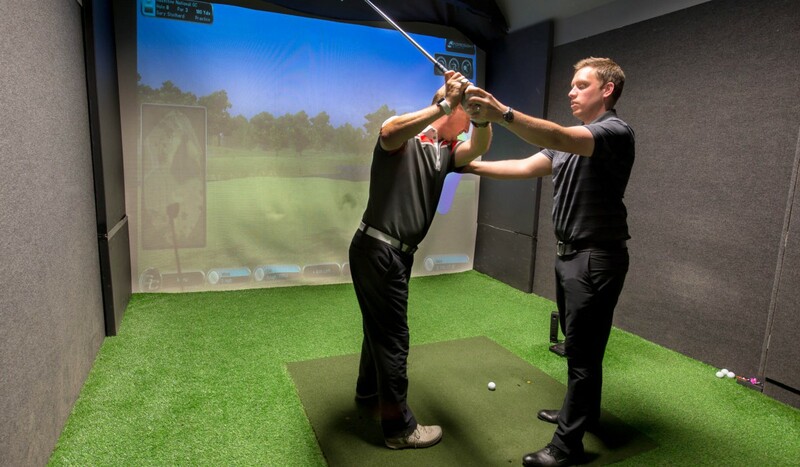 Club Fitting is undertaken in our studio. Using the GC2 and HMT we can recommend the equipment that is going to improve your accuracy, consistency and distance. It really does take the guess work out of purchasing new equipment, giving you the confidence and piece of mind you are walking away with the right product for you. Once more this is undertaken at no extra cost to your purchase offering a level of service un matched when opurchasing equipment online. Often our prices match or even better some of the main online retailers making our custom fit proposition the only choice. Game Simulation is another great way to use our studio. We have a choice of 13 courses to play with your friends socially, or work on your own on things like course management, Par 3 strategy and scoring efficiently. With 18 holes manageable in 1 hour on your own, its a great way to get a round in if you are pushed for time or when the dark nights take hold during the winter months. 13 World Class course to choose from including: Royal birkdale, Carnoustie, Turnberry, Congressional, The Belfry, Royal Troon and more!! Call Sam or Gary on 01423862547 or email [email protected] to book your studio session today. We are open 7 days a week, offer free parking and welcome non-members as well as members to come and try our facility out.